The Model 127 Inside Heat Holster from DeSantis is a simple, stripped-down, inside-the-waistband design made from tough black saddle leather for exceptional durability and performance. Each holster is precision-molded to fit firearms, improving weapon retention. The open-top design minimizes obstruction, allowing for a rapid, natural draw in high-pressure situations. The top of the holster is reinforced, ensuring it maintains its shape while empty to improve reholstering. The Inside Heat comes with a metal, powder-coated spring clip for secure and concealed fastening to duty belts. The fit of the holster is first rate. the holster hangs well on my belt the gun and magazine are well concealed by the holster. 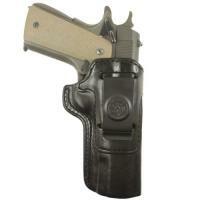 this holster is a great choice for this firearm, it has the veridian laser on it and fits the holster well.